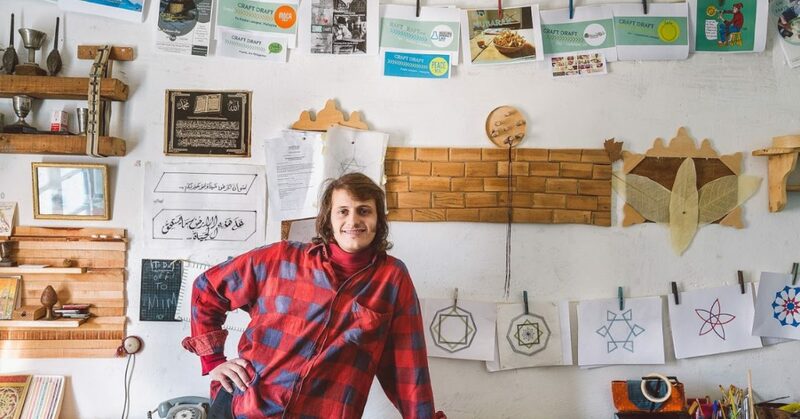 This month Krowji is pleased to welcome Moroccan Artist Hamza El Fasiki to a month long studio residency as part of the CARPET project (Craft, Art & People Together) that includes among its different activities: The Twist, a residency project that focuses on residencies for artists and craftspeople. Creative Kernow is working within the framework of the European CARPET project to offer two residency spaces at Krowji, Cornwall’s largest creative hub, for one month in November 2018 and again in May 2019. Artists based in CARPET partner countries Morocco, Spain and Portugal with an interest in co-creating and experimentation were invited to apply. Two artists from Cornwall, including Krowji-based mixed media artist Mel Johns, have been selected for residencies in the partnering countries. As with any experience of this type, the results are unknown but the main objective is to broaden perspectives, explore the potential for co-creation and foster the exchange of ideas as well as facilitate artists’ mobility internationally and contact with citizens. Artist Hamza El Fasiki has joined Krowji from Morocco for the month of November. His practice CRAFT DRAFT is a multidisciplinary art studio offering Moroccan traditional visual arts & crafts workshops to all age groups, sharing his skills in workshops around the globe. Hamza will also work together with Falmouth-based artist Megan Jordan to create new work during his residency. Visitors will be welcomed into Hamza’s studio during the Krowji Christmas Open Studios event, taking place on the first weekend of December, to see the body of work that he has created during his time in the UK.